By working for DC Direct rather than trying to produce figures themselves, Art Asylum has really opened up a whole new world of possibilities for their Minimates. When they were still doing C3 sets, everything had to be based around a specific license: if a character didn't appear on The Batman or Justice League, they were out of luck. And by trying to get into Big Five stores, a certain amount of marketability was necessary. Blue Beetle & Booster Gold would never have made it into Kmart, you know? But now, the Minimates come from DC Direct, and AA is just doing the work. That means we can get almost any character that a fanboy might want, as evidenced by Series 3's Dr. Fate and Power Girl. Dr. Fate first appeared in 1940 as a mysterious sorcerer. In fact, much like Marvel's Dr. Strange, Fate had no origin when he started and was only given one when he later proved popular. Archaeologist Kent Nelson accidentally awoke an anicent Egyptian wizard, Nabu. Fortunately for Kent, this ageless mystical force was one of good, not evil, so instead of killing him on the spot (as it had his father [accidentally]), Nabu deigned to teach the mortal his magic. The figure really does a good job of capturing Dr. Fate's design, even with the limitations of the block figure form. His yellow and blue are both very nice, solid hues, and the detail on his boots is surprisingly good. His big golden girdle thing is simply painted on, rather than being a separate piece, like you might expect. His cape and livery collar are one piece, and he has a white hair piece for when you want to take his helmet off. The face beneath the removable helmet is a man with a goatee, which means that this isn't Kent Nelson at all, but rather Hector Hall. Son of the Golden Age Hawkman and Hawkgirl, Hector had several superhero identities over the years - including a stint as the fill-in Sandman - before dying, being reborn and immediately re-aging himself to adulthood and fighting off a... well, you know, it's complex. Doesn't really matter, either. With the helmet on, this could be anybody. 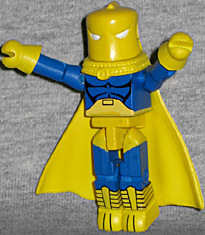 And heck, since the helmet is inhabited by the essence of Nabu and has been shown to act on its own, when you take it off it's almost like having another character in this set; except for the little ears sticking out the sides, of course. Dr. Fate has spent most of his time serving with the Justice Society, so his partner in this set is fellow JSAer Power Girl. Superman's cousin (from another universe), PG isn't quite as popular or famous as her counterpart, Supergirl, but she's more mature and more confident... usually. At least she's not acting like a snotty brat these days, so she's got that going for her. 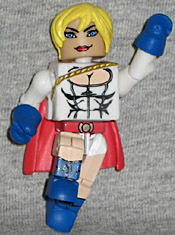 Since Power Girl's biggest trait is that she has a huge chest, there's instantly a problem with converting her to Minimate form. Unlike Palisades' PALz, which had different chest blocks for men and women, Minimates all use the same plain block. If any character needed some chestal enhancement, it's Power Girl. And the thing is, they had a perfect opportunity to do so, but missed it. In order to supply PG's cape and the braided rope which holds it on, she's got a separate piece that fits over the chest block. Yes, like the various "Powerhouse" Minimates. Her chest and waist are then painted on the front of the block. Thing is, if they'd just had the "jacket" stop halfway down the front, it would have made the chest significantly larger than the rest of her abdomen, as it should be. Think outside the blocks, Art Asylum. Other than that particular lack of insight, the figure's pretty good. She's got a slight smirk on her face, and even the folds of her boots have been painted on. Her hair is a new piece, with a little strand falling down between her eyes. She sort of looks like Kara Thrace (Starbuck, to those of you who aren't hip with Battlestar Galactica), but it's not the same 'do. This Justice Society set is a good buy. 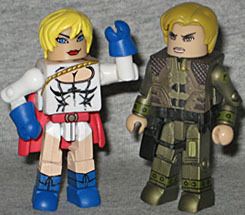 Both figures are pretty good, even if Power Girl could have been better with just a little thought. All Minimates share the same body with different paint decos, and they all move at the same 14 points: balljointed neck, waist, balljointed shoulders, elbows, wrists, balljointed hips, knees and ankles. That's a ton of movement for a 2" figure. The pair of them will fit nicely in your DC Minimate collection, and give a much-needed breath of fresh air from the constant Batman and Superman releases.